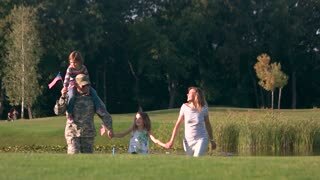 Happy soldier with his family in park. Man in camoubackgrounde, wife and two little daughters. 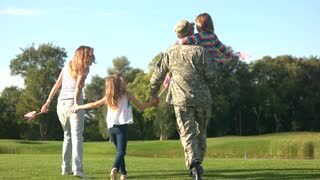 Back view close up happy family with military father. Daddy in camoubackgrounde with his daughters and wife walk together in the summer. Soldier and his family going toward the lake. Back rear view happy family with father soldier of US army in camoubackgrounde. Soldier in camoubackgrounde spinning his daughter around in the park. 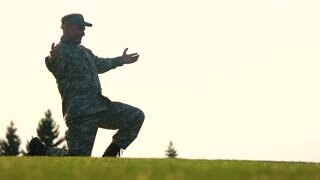 Outdoor portrait of happy father in military uniform holding his daughter's hands and spinning around. 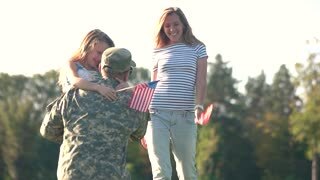 USA soldier reuniting with his happy family. Daughters and wife coming to their father, side view. Meadow at the summer evening. Soldier meet his daughters in the park, side view. 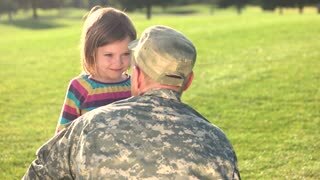 Daughters come to their military father in camoubackgrounde and hug him. Back view soldier in uniform walk with daughters. 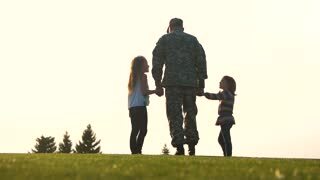 Military man in camoubackgrounde walking holding hands of his little daughters. Soldier in camoubackgrounde with his family in the park. 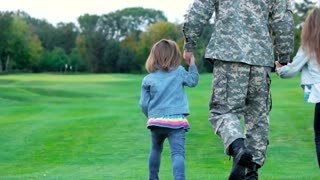 Happy walking family holding hands with military father. Back side view USA soldier in camoubackgrounde hugging with family. 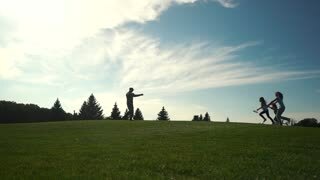 Embracing wife and daughter on the summer lawn.